Atrial fibrillation, or AFib, is a kind of heart rhythm irregularity, or arrhythmia. In fact, it is the most experienced kind of arrhythmia. When a person has AFib, the body’s electrical system is malfunctioning and sending chaotic signals to the heart, causing it to beat out of rhythm. 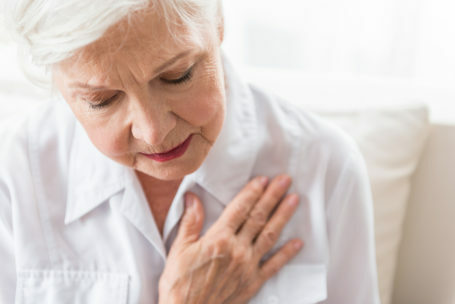 An older adult with the condition may feel like there’s a fluttering in their chest. AFib can also make the heart beat very fast or feel like the heart is skipping a beat. Although there are treatments for AFib, living with the condition may require the senior to alter their lives a bit to stay as healthy as possible. Below are some tips for living with AFib. It’s common for people to withhold information from their doctors because they think it’s trivial or because of fear. However, it’s very important for your aging relative to tell their doctor how having AFib is affecting their life. They should tell the doctor if they have cut back on activities because they are afraid of having problems due to their condition. They should also be honest about how they are feeling, reporting any issues or symptoms they are experiencing. Rich in vegetables, fruits, and whole grains. People with AFib need the support of family, friends, and other caring individuals, like elderly care providers. Not only is the disease stressful to live with, but it can also make certain activities difficult. The older adult may feel too tired at times to keep up with daily activities, like cleaning or cooking. Elderly care providers can take the pressure of needing to do those tasks off your aging relative by doing them for the person. Having an elderly care provider around can also make the senior feel safer, knowing they have help available if it is needed. If you or an aging loved-one are considering Senior Care in Oakland, PA, please contact the caring staff at In-Home Quality Care today.